Leat Cottage near Bampton is a one bedroom property which enjoys a secluded rural setting bordering Exmoor National Park. It is beautifully and tastefully furnished and sits within the owners six and a half acre grounds. 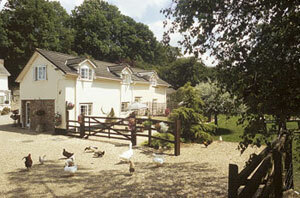 Guests can relax in the shared lawned garden overlooking the terrace and sometimes visited by the local hens and ducks! The cottage is just 2 miles from the attractive little town of Bampton, 'Britain in Bloom' winner and a blaze of colour throughout the summer, with good shops and eating places. Nearby places of interest include Wimbleball Lake, which is just 5 miles away and offers fishing and water sports. Dunster Castle, Minehead and the coast are all within ½ hour's drive. Riding, golf and good pubs locally. One bedroom. Very comfortably furnished open plan sitting room with part screened dining and kitchen area. First floor: Large double bedroom with 6' bed (twins by arr), beamed sloping ceiling, additional single bed (for + child) and ensuite bathroom/W.C. (shower attachment).